How many different species are shown blooming in this very small area? 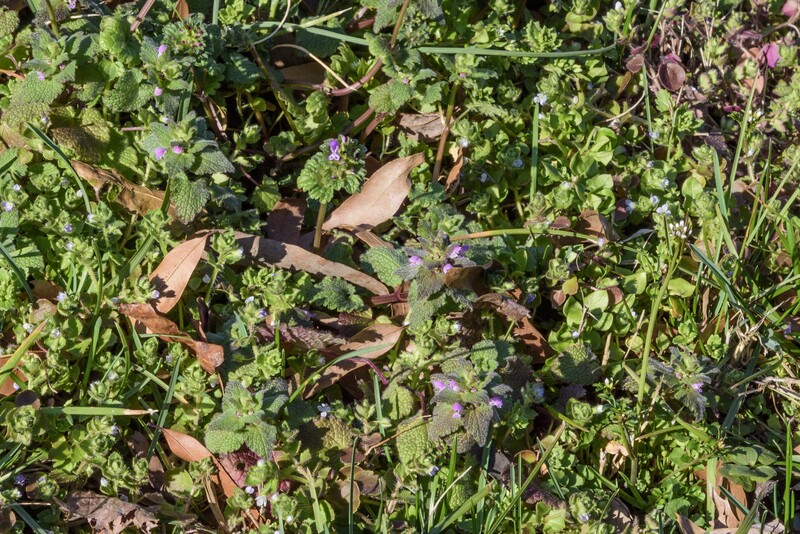 Two days ago the Maryland Biodiversity Project held a single species bio-blitz: submit photos of purple deadnettle (Lamium purpureum) blooming that day. With about an hour to kill before heading out for another activity, I got the camera and went for a walk in a nearby park. Before finding a few of the target plants, I snapped quick photos of anything else that was flowering. I found hairy bittercress (Cardamine hirsuta), two or three types of speedwell (Veronica species), dandelion, (Taraxacum species), and henbit (Lamium amplexicaule) in open areas, and in the woods snowdrops (Galanthus nivalis) and periwinkle (Vinca minor). These wildflowers have something in common, other than being our earliest blooming plants: they’re all aliens. The only natives blooming now are skunk cabbage (Symplocarpus foetidus) and some maples (Acer species). And some stupidly early spring beauties, as I reported last week. This got me thinking. I have pictures of literally hundreds of different species of native wildflowers from the Maryland piedmont alone, but very few of the aliens. I love the natives so much, and find them so interesting, that I ignore the others. But some of the aliens are rather pretty, and even if they’re weeds, they’re wildflowers, too. So this year I’m going to pay more attention to them, get good pictures, do the research, and feature them here. There are at least four different species of flowers in the picture above. I can spot purple deadnettle, henbit, hairy bittercress, and one or two of the speedwells. This entry was posted in Uncategorized and tagged aliens by elizabeth. Bookmark the permalink. I love this idea. I ended up taking photos of coltsfoot and speedwell on Saturday. They are pretty, and I know they aren’t native, but… The political atmosphere at the moment makes me wonder why I dislike the “alien” species so. Some, like lesser celandine or garlic mustard, I totally understand why I hate them. But is coltsfoot a problem? I don’t even know how to explain the difference between “invasive” and “non-invasive.” Is it just nature, survival of the fittest, that garlic mustard can wipe out the bluebells along the Potomac? I think too much. Carderock blooming update from this afternoon: hepatica, spring beauties, a few cutleaf toothwort, and one lone, tiny, cold-looking bloodroot. Plus one open flower on one bluebell plant. Also vinca, speedwell, ground ivy, bittercress. And one saxifrage sending up a flower stalk (not blooming yet, but the buds are there.) Toadshade has emerged. Thanks for the report! That’s about a month earlier than I’ve ever seen hepatica and toothwort blooming there.